FIRST-CLASS EDUCATION IN A WORLD-CLASS CITY . . .
GGU Law is a dynamic, flexible, and supportive law school committed to serving students and helping them succeed. With small classes and dedicated teams for student support and career development, GGU Law features personalized attention and outstanding opportunities for academic success and professional development. Our downtown San Francisco location is vibrant and bustling, offering a rich array of real-world opportunities and unmatched access to courts, law firms, advocacy organizations, and government agencies. GGU Law students engage in pro bono and other legal work under the supervision of practicing lawyers and the guidance of thoughtful and experienced professors. Golden Gate University School of Law is fully accredited by the Council of the Section of Legal Education and Admissions to the Bar of the American Bar Association (ABA), the Committee of Bar Examiners of the State of California, and the Western Association of Schools and Colleges Senior College and University Commission (WSCUC). GGU Law is also a member in good standing of the Association of American Law Schools (AALS). GGU Graduates qualify to take the bar exam in all 50 states and in the District of Columbia. As a first-generation college and law school graduate, I am honored to be the Dean of a law school that has been dedicated to expanding opportunity and access to the legal profession for more than a century. GGU Law’s commitment to fostering a diverse and inclusive environment, combined with its high academic standards and compassionate teaching, make for a superior law school education that produces excellent lawyers. 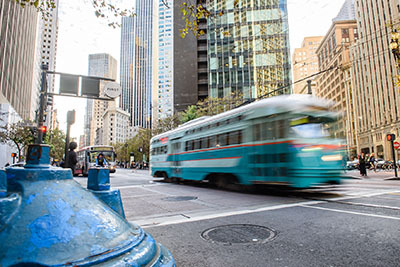 Located in San Francisco, the booming economic and technological center of the country, our downtown location offers a rich array of real-world opportunities and unmatched access. Students are steps from courts, law firms, advocacy organizations, government agencies, and the technology and business communities. 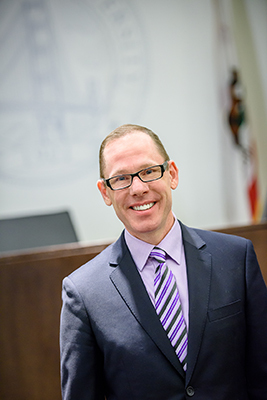 GGU Law students get cutting-edge experience through pro bono and other legal work under the mentorship of practicing lawyers and with the guidance of thoughtful and experienced professors. At GGU we are committed to serving students as we help them succeed and reach their full potential. With small classes and dedicated teams for student support and career development, GGU Law features personalized attention and outstanding opportunities for academic success and professional development. As I look back at the professors and mentors that shaped my legal education, I will always endeavor to pass along that support to each and every one of you. I hope you will join me and the entire GGU Law family in San Francisco as we work to develop excellent lawyers and compassionate leaders who work toward a better community and world. Golden Gate University School of Law believes lawyering is an honorable profession, worthy of the public trust. Toward that end, we provide students with a solid foundation in legal theory and the skills necessary to be a successful practitioner. JD students develop professional skills through a variety of programs including: clinics, certificates of specialization, the Honors Lawyering Program, joint degrees, and more. GGU students are taught by an accomplished and diverse faculty, who practiced law before teaching. They are experts in a wide range of legal areas -- from litigation to labor law, corporate law to criminal law, property development to public interest law, environmental law to entertainment law, international law to intellectual property law -- and much more. Our student-to-teacher ratio is 19:1, and our professors are committed to being accessible to students. GGU Law has a special commitment to public interest law. In addition to a strong public interest law curriculum, the school offers financial assistance to students who pursue careers in public interest law, and our in-house clinics provide legal assistance to underrepresented populations. You will practice law in a complex world. GGU students reflect a wide variety of ages, work experience, and cultural, ethnic, and religious backgrounds. Our more than 20 student organizations address the many interests of our diverse student population. GGU's 1,000 law students include working professionals and recent college graduates from more than 100 undergraduate and graduate institutions. They come from across the United States and from a number of foreign nations and represent a wide spectrum of ethnic, economic, and cultural backgrounds. Our Law Career Development Office provides students ongoing support from the time they enter law school through graduation. We at Golden Gate University School of Law believe that law is an honorable and valuable profession worthy of public trust. Our goal is to prepare our students to be critical thinkers, problem solvers, and leaders, with the flexibility to respond to changes in the legal profession. To that end, we blend practical skills training with legal theory throughout the curriculum as we strive for excellence in both teaching and scholarship. Our mission is to produce a diverse group of graduates with the skill, judgment, and moral compass to become exceptional lawyers and socially responsible members of the global community.